Your migration concerns deserve accuracy, not guesswork. 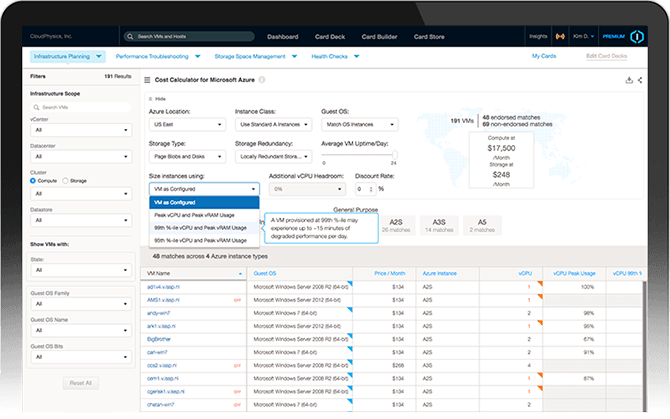 Now the Public Cloud Planning Rightsizer ensures that your VMs are provisioned for the greatest cost-savings when running in the public cloud. Be confident of no wasteful overprovisioning or applications starved by underprovisioning. The Rightsizer tells you the exact resources each VM needs—storage, memory, network, CPU etc.—based on granular usage data from your own organization, updated every 20 seconds. Rely on instant, accurate analytics for your cloud workloads. Calculate with confidence! The Public Cloud Planning Rightsizer enables accurate provisioning for your VMs running in the public cloud. Plus, you can create and compare various rightsizing scenarios based on your own usage data for on-target accuracy and decision-making. What are the true benefits of running your applications in the public cloud, as opposed to remaining on prem? While you want the savings and convenience of the cloud, you’re also concerned to save money. The Public Cloud Planning Rightsizer delivers instant, granular visibility, so you can ensure that you gain the greatest cost benefits from your migration, with provisioning precisely mapped to actual needs. Leverage data science and big data analytics for immediate insight into your virtual environment.